Made in Australia, the Discoverer® core trays are rugged and lightweight. They are also fully recyclable. Built in handles: Built in handles on both ends of the trays provide a safe and easy way to handle the trays. 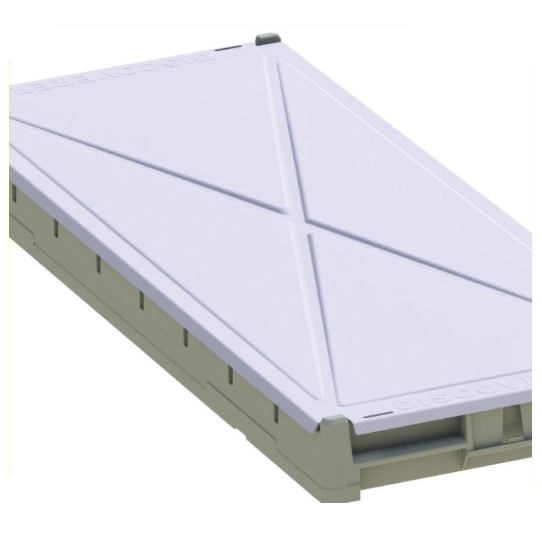 Custom Made Lids: Made from the same high quality material as the tray, the lids will withstand the harshest conditions and have the same proven longevity out in the field as the trays. Made from a nice bright white plastic they are also easy to write on if required. 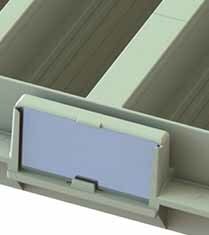 Clip-in Core Markers: Clip in Core Markers are designed to optimize the use of the tray. Colour coded to match trays. Top surface etched allowing you to record notes. Full Depth Channel Height: Full Depth Channel height ensures the core sits below the ribbing, giving greater stability when stacking. Bold Start Indicator: Bold Start Indicator gives clarity to drillers, reducing potential errors when logging the core. Drainage Holes: Drainage holes throughout help your core to dry out and to remain stored in premium condition. ID Tag Area: Built in ID Tag area and optional Tags provide for a permanent record of contents. Strapping Slots: Strapping Slots ensure greater stability when palletised. 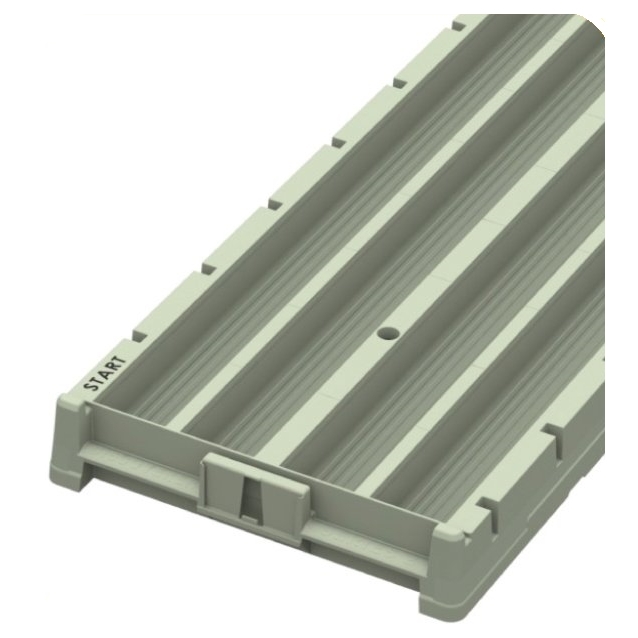 A proven track history of almost 20 years of industry use, the Discoverer® plastic core trays have been based on the original design “The Explorer” which has been used in the field since 1995. Safety: The Discoverer® plastic core trays remain relatively cool to touch when left outside, unlike metal trays. Therefore no more painful burns when handling core trays. Rounded edges mean no more dangerous sharp edges, leading to improved safety when handling. Built in Handles on both ends of the trays provide safe and easy use when handling. Being manufactured with a one piece mold means no unusable trays in use, reducing the chance of workplace related injuries. Superior Strength and Durability: Made from a one piece mold, meaning no pop rivets and welds which increases the products strength and importantly no sharp edges. The Discoverer® is made using the highest UV stabilized polypropylene available making it exceptionally durable in any harsh mining or exploration environment. Manufactured from exceptional quality raw materials, which makes it extremely resistant to impact and crushing. The Discoverer® Sub Zero is manufactured for use in freezing conditions and trays are tested to minus 50°C. Ease of use: A bold start indicator has been designed to make it absolutely clear to the driller at which end they should commence loading the core from, eliminating possible errors in the logging process. The trays are colour coded, allowing for quick and easy identification of the different sizes both in storage and out in the field and when re-ordering. The Discoverer® has a built in ID Tag area and optional aluminum tag inserts providing a permanent record of contents. The Discoverer® has standardized sizing. The majority of sizes used in the environmental, mining and exploration industries are H, N, P & B core diameters. Lengths are standardised making all the trays 1m (3.49ft) long. Maintain Your Core Integrity: The materials used during manufacturing have a high level of resistance to organic chemicals that are found in some drill core recovery, meaning your core won’t become contaminated. The Discoverer® is non-magnetic and will not corrode keeping your core free from magnetic susceptibility when testing and ensures no corrosion of the trays occur. The unique raised ribbed design helps to retain the quality of your core by improving drainage. The Discoverer® core trays cannot be affected by insect infestations like wooden core boxes as the plastic is not penetrable. The plastic used in the core boxes will not migrate or leach into your core samples. The Discoverer® core trays have a range of accessories available and one of these is the custom made lid which assists to maintain your core’s integrity at all times. 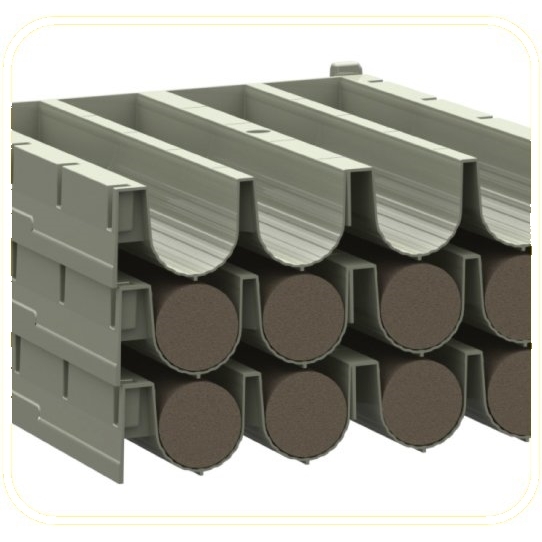 Only the Discoverer® core trays have unique a stacking capability, which allows the trays to stack perfectly on top of each other, loaded with core without touching the tray below. This means that your core is stored without interference, helping to retain the quality of the core.